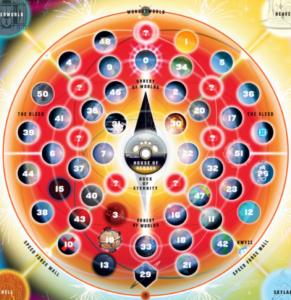 In recent Issues of the podcast, I have spoken about the structure of the Multiverse, specifically referencing the map created by Grant Morrison and Rian Hughes in the pages of The Multiversity Guidebook #1. 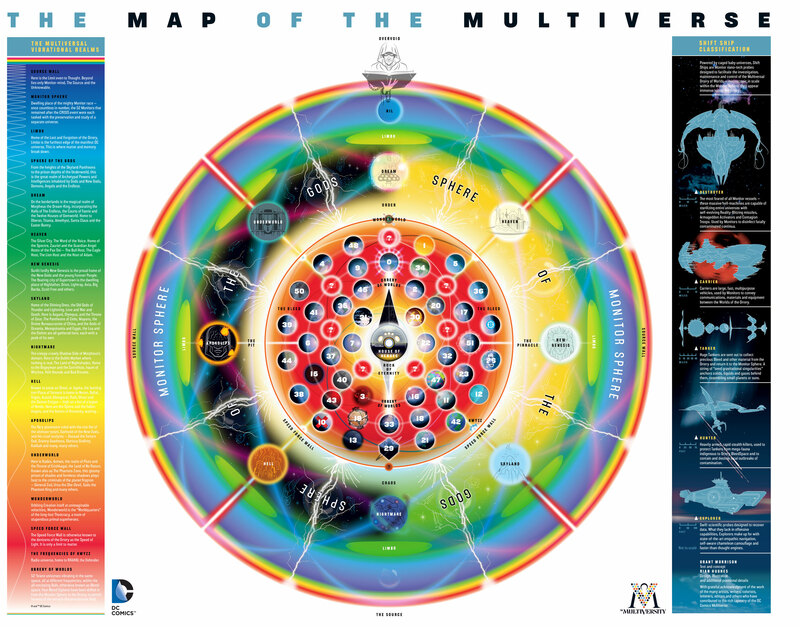 As you might imagine, there is quite a bit to sift through, so I’m going to break down the map of the Multiverse to make it easier to understand. The main continuity of the DC Universe, otherwise known as Prime Earth. This world is home to young versions of Golden Age heroes like The Flash (Jay Garrick), Green Lantern (Alan Scott), Doctor Fate, Sandman, The Atom (Al Pratt), and more. The entire morality of this Earth is skewed towards evil, and is home to the Crime Syndicate of America, the evil counterparts to the Justice League. Home to the New Reichsmen, this Earth’s version of the Justice League enforces order in a world where the Nazis won World War II. Birthplace of the heroic Freedom Fighters, this Earth is also known as Earth X. A cartoon universe home to Captain Carrot and the Amazing Zoo Crew. This Earth is the real world where we exist, devoid of real superheroes (save for Ultra Comics). The universes within the Orrery are kept separated by something called The Bleed, dangerous inter-dimensional territory through which certain individuals and ships can travel by tuning to the vibrational frequency of another Earth. The Orrery of Worlds is closed in by the Speed Force Wall – the extra-dimensional energy from which all Multiversal speedsters gain their powers. Because they are connected to the Speed Force, speedsters such as The Flash are able to easily travel between parallel worlds. Beyond the Speed Force Wall lie the vast realms of the Sphere of the Gods. There are eight realms in this sphere, organized into four pairs positioned opposite each other surrounding the Orrery of Worlds. These realms are the literal domain of dreams and nightmares, and the home of Dream of The Endless, also known as Morpheus or the Sandman (as seen in Neil Gaiman’s Sandman series). Doctor Destiny also gained access to the power of the Dream realm through the use of the Materioptikon. The Heaven and Hell of the Abrahamic faiths (Christianity, Judaism, and Islam), these realms are home to angels and demons, respectively, and the source of power for those who wield holy/unholy magic. These two opposing worlds are home to the race of New Gods. On New Genesis, the benevolent Highfather steels his people against the indomitable will and evil of Darkseid and the hordes of Apokolips. Other notable New Gods include Mister Miracle, Big Barda, Steppenwolf, Kalibak, and more. Skyland and Underworld are home to the various pantheons of other gods. The Olympian gods, Rama Kushna, the Aztec pantheon, and all others occupy these realms according to their morality. All gods of all the worlds of the Multiverse exist within and draw their power from these realms. Existing on a higher plane than the Orrery of Worlds, all of these realms are multiversal, meaning that all of the gods and spiritual magics of the various universes of the local multiverse feed back to those realms. This doesn’t mean that the Olympian gods of multiple Earths ever encounter each other, only that they and their powers originate from the same higher dimension. The highest sphere of the Multiverse, the Monitor Sphere is home to the race of Monitors, the protectors and administrators of the entire Multiverse. They are immortal, trans-dimensional beings of immense power, so much so that they refer to the inhabitants of the Orrery as “germs”. To them, the entire Orrery of Worlds appears as a glass container in which the universes sit. At the outermost edge of the Multiverse lies the Source Wall. Visible in every universe and realm of the Multiverse, the Source Wall is a physical, impassable boundary beyond which lies the Source, otherwise known as the energy of creation, the Life Equation, or God. Those who attempt to break through the Source Wall are consumed and become part of the wall forever. Hopefully this breakdown helps a bit for future episodes. 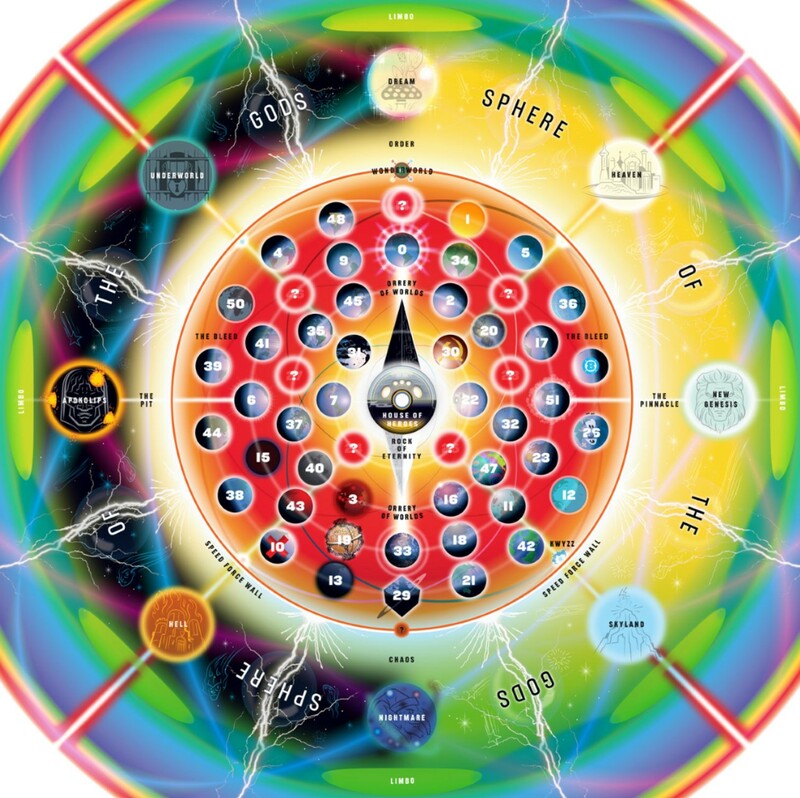 Undoubtedly, the structure and nature of the Multiverse will come up again as we navigate the DC Universe.